If you want a dipped cone in the Toronto area, you’re covered. 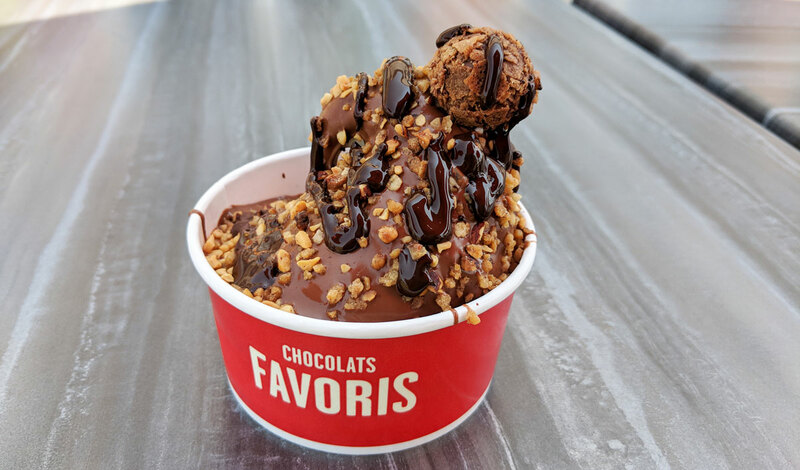 Aside from Chocolats Favoris (which hasn’t expanded to the city quite yet), you’ve got relatively new places like Sweet Jesus, La Diperie, and Hollywood Cone, not to mention old standbys like Tom’s Dairy Freeze and the always-reliable Dairy Queen. Note to all future restaurateurs: we’re all good for dipped cones. May I suggest you open a frozen custard joint? 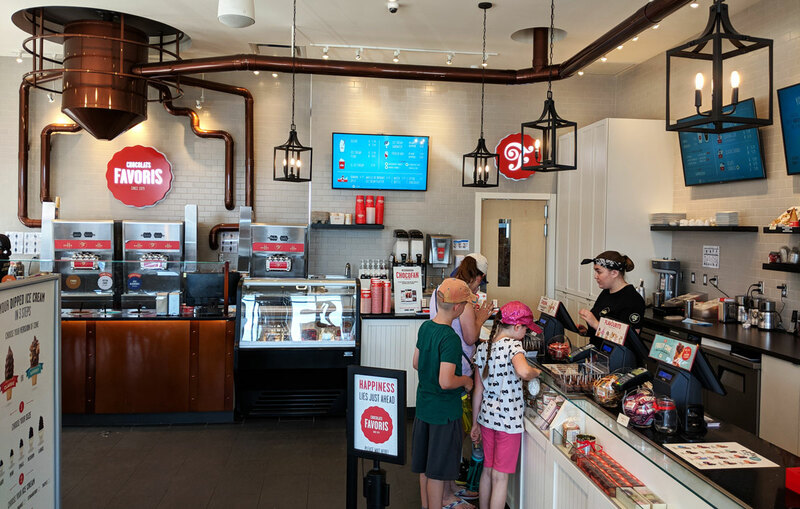 Or maybe a traditional sundae shop? 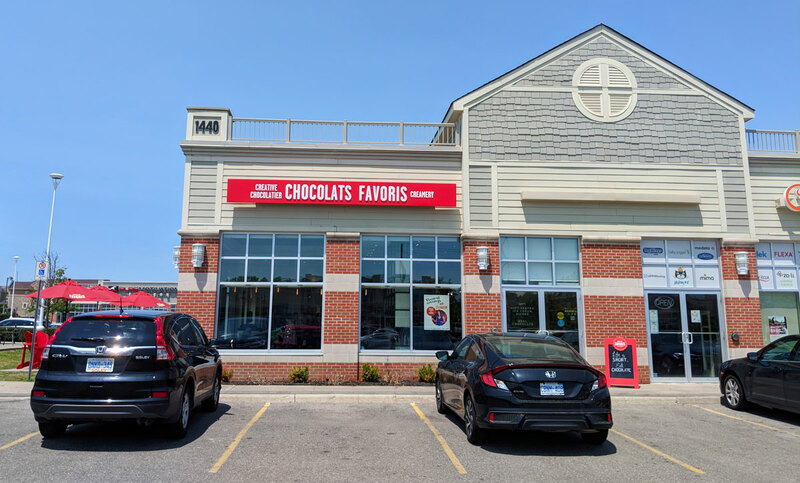 Chocolats Favoris (which is a Quebecois import, as you might infer from the name) sells dipped cones with a particular emphasis on the chocolatey dips; they’ve got about a dozen you can choose from, which you can either have as a plain dip, or in one of their customized combinations. I went with the latter, and got the Hazelnut Praline, featuring vanilla ice cream with a chocolate hazelnut dip, hazelnut pieces, and dark chocolate sauce. It’s garnished with a Ferrero Rocher-esque confection. The chocolate hazelnut dip was quite tasty, which is good because there was a lot of it. I don’t know if there’s always that much or if the woman behind the counter was just feeling generous, but the sauce layer was about a centimetre thick. It basically tasted like a slightly sweeter, less hazelnutty version of Nutella. The texture was interesting; it didn’t get quite as crackily as your typical chocolate dip (it might have been laid on too thick to properly harden). It was fudgy and chewy, which actually worked quite well. It’s basically vanilla ice cream with a bunch of Nutella mounded on top. It’s hard to go wrong there. As for the ice cream itself, it was fine. It was about on par with what they’re serving at Sweet Jesus, which is to say that it was tasty, but nothing special. Previous Amazing Roast Beef at Woodfire Sandwich Co.